Lancome 441N Midnight Rose Vernis In Love review and photos. Lancome 441N Midnight Rose Vernis In Love. Lancome has been a welcomed surprise in the nail polish department. Since the purchase of Lancome 585N Noir Caviar Vernis In Love (reviewed here) a few weeks ago, I have since returned to Sephora to purchase another color, Lancome 441N Midnight Rose Vernis In Love ($15 USD/6ml/.21 fl. oz.). 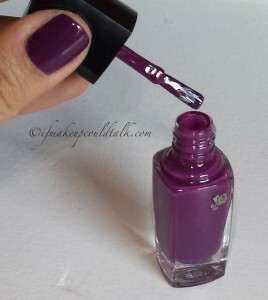 The beautiful deep violet hue is appropriate for all age groups and for any occasion; tack on the amazing wear and high shine quality, for the ultimate nail polish formula. Lancome 441N Midnight Rose Vernis In Love applied with the greatest of ease. Opacity was reached using two coats, resulting in a smooth and even finish. This is one of the best nail polish formulas I have ever come across; the polish has a very stable consistency that adheres to the nail beautifully and rarely seeps out onto the cuticle. 441N Midnight Rose lasted six days on my nails without any chipping. By Day 5, the polish did not look as “fresh,” but from afar, no one would have been the wiser. Another alluring quality has to do with the ease in which this polish is removed. My Zoya Polish Remover easily lifts the polish from the nail beds without leaving any residual staining. Lancome 441N Midnight Rose Vernis In Love brush head. The brush on Lancome Vernis In Love polishes is perfection. The brush design is intended to accommodate a variety of nail widths and lengths. This brush splays out perfectly on the nail bed for optimum color placement, using minimum brush strokes. OPI, Chanel, Estee Lauder, Lancome 441N Midnight Rose Vernis In Love, Dior, and Deborah Lippmann. My only criticism lies with the amount/price ratio. 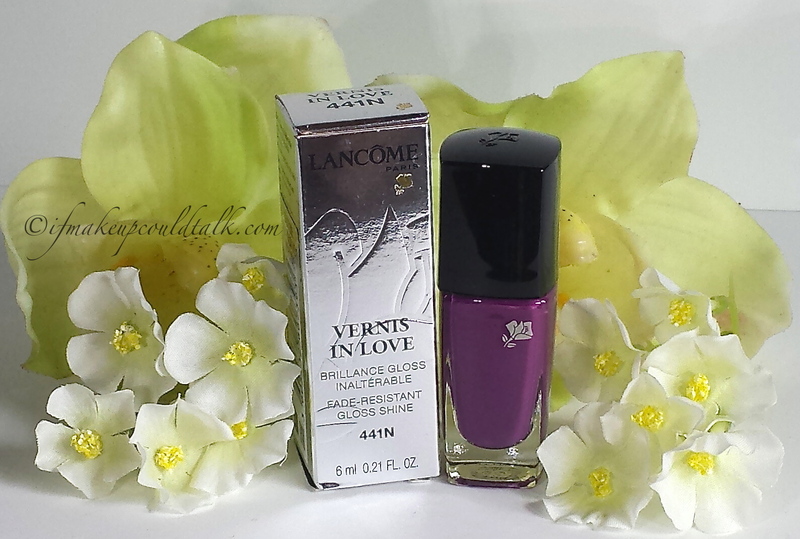 Lancome Vernis In Love polishes offer well below what other nail polish brands provide. As you can tell by the photo, my little Lancome 441N Midnight Rose Vernis In Love is the tiniest of the lot. However, despite the measly amount, I would not hesitate for one moment to add more Lancome polishes to my collection; they are that good. Lancome Vernis In Love Polishes can be found at Nordstrom, Sephora, Saks, etc..